First, let me say that if you’re looking for something to do and you haven’t seen Slow Girl, then go and see it at Dobama: I was there opening night and enjoyed the play. Leighann DeLorenzo (Director) did a fantastic job keeping the pace taught on a play that has a good potential to drag or, to be punny, slow. Let’s face it, a two hander with a middle-aged man and a teenage girl that involves heart-to-heart conversations has a great likelihood of not working. After all, what really is there to discuss? Delorenzo also does a great job in balancing the serious nature of the questions (stated or not) at play and the humor that often occurs due to the imbalance of experience between the characters. In the case of Greg Pierce’s play there actually is a bit to discuss and the exposition is handled deftly. Information is released reluctantly and at the right time with a good bit of audience interest necessary to tease out and discover what actually is going on. The teenage girl, Becky (Miranda Leeann Scholl), is difficult to trust. The mystery surrounding her present difficulty is not immediately clear nor is her role in the problem that she has. Her maternal uncle, Sterling (Christopher Bohan) is a mirror image of Becky in his own problems. Both have experienced social events that scar them and leave them ambivalent about engaging with people. The two are, however, forced to interact because of proximity and blood relations. Becky is short for Rebecca, which is Hebrew for “a snare.” According to “Behind the Name,” Sterling can be a surname from the Scotish city of Stirling, whose meaning is lost to time; or the embodiment of the name for silver which, apparently, Norman coins bore, meaning “star.” A snare is a small trap for catching birds, and it is perhaps significant that the eponymous “Slow Girl” of the play is wearing bird wings at a party and claiming to be able to fly. The question remains, is Becky the snare or has she herself been ensnared. Society has always been a prickly pear. Reading my literary history works that keep certain writings in context, one quickly learns that the social structures and opinions of a time period often had great influence on a writer: think Lord Byron or Percy Bysshe Shelley, etc. Nowadays the pressure has intensified with the almost claustrophobic presence of social media. Your failure to behave appropriately in virtually any circumstance can be the instantaneous trigger for your eternal damnation. It is no surprise, then, that these two characters find themselves ensnared in a milieu of their own making. The play is about more than the events that place Becky and Sterling in their respective darkness, however. It is not a play about overcoming not the social response to an event, but to strengthening yourself to handle it: to confront what you have done, make a decision about its correctness, to gain confidence in your own certainty about events, and to move forward. In this regard, both characters need each other to do so. Before they can move forward, however, they need to expose themselves to each other, which means letting the crusty defensive exteriors break and fall apart. While there are several ways that this is accomplished in the play, the most dramatic is the labyrinth on the floor—modeled on that of Chartres Cathedral, I believe. In this case, the labyrinth is a contemplative force: meditative. 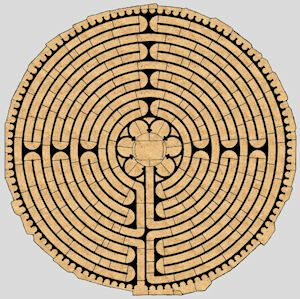 Like that in Chartres, you walk the path of the labyrinth and consider the trap you’ve found yourself in. Hopefully, through meditation, you’ll find your way clear to understanding your position: if not your way out. Labyrinths are everywhere in the past, from the maze that Daedelus hazards against the dreaded Minotaur to the spiral carvings on stones outside of Celtic barrows. We are always spiraling in and out of consciousness, in and out of this world, in and out of ourselves, in and out or own precarious situations and habits. This is a play about how two ensnared people help each other out. It is only through this lens that the ending can be appropriately understood. The actors did a great job in this production and Laura Carlson Tarantowski’s set design is impeccable. 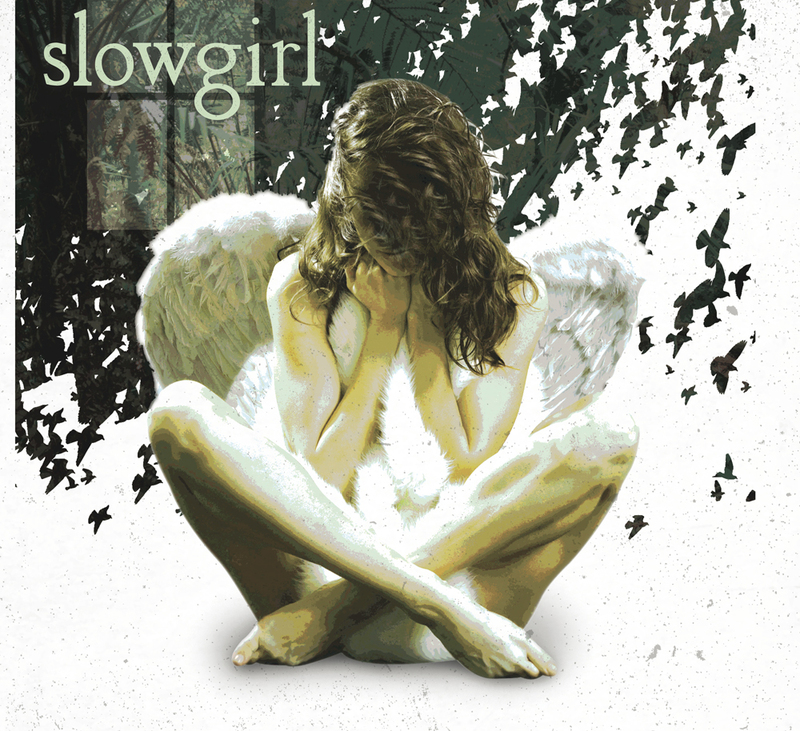 This sounds like a fabulous production of “Slow Girl.” As you said, a story like this could be one of those that seems to drag on. But if done right, it can be a a touching message to all of those who may struggle in the social realm.